Purchasing a mirror in the thirteenth century should not be considered remarkable. People had been using mirrors all across Eurasia since ancient times. By the thirteenth century in China, mirrors had been in use for almost two and a half millennia. What should be considered remarkable for that period is that anyone would make a mirror contrasting traditional womanly virtues with a more expanded range of options, including artistic and intellectual accomplishments. Explaining how such a thing could happen is not easy, but some developments that would help explain this are described below. • Performance on public examinations was an important way to obtain an official position. Since a government position provided a good salary and some privileges, and because the examinations were not closed to men of common birth, education was an important way for a man to climb the ladders of social mobility. Women generally were barred from public office all across Eurasia at that time. But since it was mainly the women who raised children, a child would receive his or her earliest education from the mother; therefore, education for women became desirable. 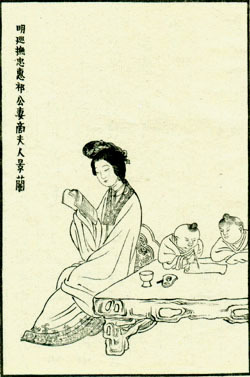 The image (right) depicts the wife of a government official in the Ming Dynasty with two children who are studying at home. Original illustration by Ren Xiong (1820–57). Facsimile edited by Men Xianjun (Beijing: Wenwu Chubanshe, 1995). • After the eighth century, some nonaristocratic, but educated, men like Du Fu (712–70 AD), (768–824 AD), Bai Juyi (772–846 AD), and Liu Zongyuan (773–819 AD) came to see themselves as a voice for victims of injustice who could not speak for themselves. Thus, during this period, we find more examples of literature exposing unjust practices, some of which defended the dignity of women. Bai Juyi wrote poems criticizing traditional marital customs, as well as the treatment of women after marriage. During the Song Dynasty, Mei Yaochen (1002–60 AD), Su Dongpo (1037–1101 AD), Lu You (1125–1210 AD), and many others continued this practice. The expanded range of concerns in public debate began to affect political and legal institutions. For instance, the Song Dynasty passed new laws protecting tenants from certain forms of exploitation. About the same time, the property rights of women also began to improve.• In traditional societies, a person’s status was often determined by custom. For example, if your father were a squire, then you would be a squire; and if your father were a farmer, then you would be a farmer. Your clothing and personal belongings reflected your status that was determined by birth. But when the aristocracy lose their privileges, a person’s status can no longer be defined by heredity, which means that people have to find a way to show others who they are or what they are like. One of the best ways to do this is by changing a range of appearances: your clothing, your home, your garden, or your personal belongings. In China, the aristocracy began to lose their privileges as early as the tenth century. By the eleventh century, many previous political and economic privileges of the aristocracy had been curtailed by law. Because the nobility used to set the standard for what looked good, it was obvious that you had to break down those standards before you could develop new ones. So we find much literature during the Song Dynasty criticized the aristocracy and their taste. This idea that showy ornament is shallow had a profound impact on the arts of painting and calligraphy, in which the Song literati generally preferred simple, “honest” styles over highly refined, fancy styles. You can also trace this ideal in women’s fashions. Song paintings of educated but non-aristocratic women typically show them having simple hair styles and wearing rather plain, unembroidered skirts. 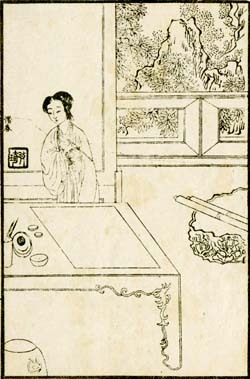 The picture above is the 1921 reprint of the illustration of the heroine Xi Chun as she is about to paint, from Hongloumeng tuyong (Pictorial and Poetic Tributes to Heroines of the Novel Dream of the Red Chamber), which was originally published in 1879. • By the Song Dynasty, the debate over the status of women extended to the realm of art. Su Dongpo’s friend Huang Tingjian argued not only that a woman could paint as well as a man but also that her art could be just as manly!In histories of art from this period, women were given credit for inventing major genres, such as the ink bamboo that became so dear to literati painters. This helped set the stage for the entry of women into artistic and literary circles (Read some comments made by literati). The most famous and influential literary woman of the period was Li Qingzhao (1084–ca.1151 AD), a woman who may have been an inspiration for this mirror. Li Qingzhao’s father was a friend of Su Dongpo, Huang Tingjian and other free-thinking intellectuals of the period.Early in life, Li Qingzhao earned a reputation for her bold personality and original literary production. She eventually came to be regarded as perhaps the greatest lyric poet of all time. Together with her husband, Zhao Mingcheng, she collected and studied antiquities. Woman literatus participating in the composition of a collective poem at a garden party. 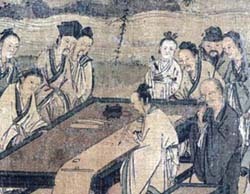 Detail of the handscroll Literary Gathering by Ma Yuan. Song Dynasty, 13th century. Courtesy of the Nelson-Atkins Museum of Art, Kansas City. By nature I am impatient; from the beginning I accustomed myself to only one dish of meat. I have no need for beautiful pearls or rich ornaments such as kingfisher feathers. Our home boasts no gilding, embroidery, or brocade. But when I come across books by great authors, then the characters must be perfectly printed and sharp. I will not purchase any fake or abridged editions and frequently resell duplicates. From Xu Beiwen, ed. Li Qingzhao quanji yizhu [Collected Annotated Works of Li Qingzhao] (Shangdong: Jinan Publishing, 1995, 213–14; translation by Marty Powers). Does this sound familiar? Li Qingzhao is saying that she does not care about trivial things like pretty clothes and jewelry, but as for books and art, now that requires serious attention! It is not hard to imagine how other women, inspired by Li Qingzhao, might want to declare their support for such ideals with the one object most closely associated with feminine beauty: the mirror. When the woman who owned this mirror looked into it, she might compare herself to the plum flower, beautiful but not showy. Her companions, viewing the back of the mirror, would know that her true beauty resided in her talent and strong character. Read some of the biographies of people mentioned in this site.